The shortage of English teachers for the programme on teaching English to primary school students, which was warned before when the program was launched, has become more serious. According to the Deputy Minister of Education and Training Nguyen Vinh Hien, the recent examination over primary school English teachers’ capability has found that the percentage of teachers who can meet the standards (B2 level, which is equal to 500 points of TOEFL) is low. Hien has admitted that Vietnam not only lacks English teachers for primary schools, but also faces the problem in the foreign language ability and pedagogical skills. A survey conducted by the Ministry of Education and Training (MOET) found out that prior to the 2011-2012 academic year, there were only 100 primary school English teachers out of the 150 surveyed teachers, who could meet the English qualifications. 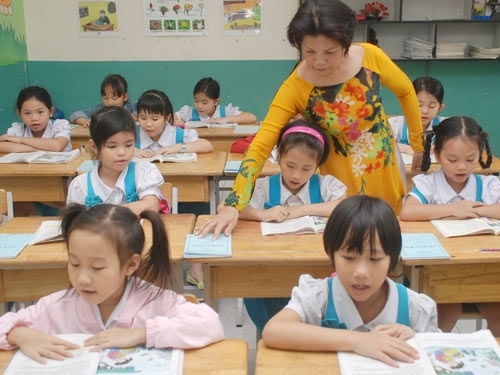 The representative of the Quang Nam provincial Education and Training Department said that the department is now seriously lacking English teachers, while primary schools alone need 300 teachers. He said that the qualification of the teachers remains limited, and they still have to do a lot of things to upgrade themselves to meet the domestic standards, let alone international standards. Phung Thi Hoang Yen from the Phu Tho provincial Education and Training Department also said that a lot of schools in the locality are seriously lacking English. However, as it is very difficult to find out standardised teachers, the local education department has not joined the program on teaching English to third graders for the last two years. Primary schools now do not have the teachers who have gone through methodical training courses to be capable enough to teach primary school students. Hien has pointed out that the key problem here is that schools cannot offer high salaries to recruit qualified teachers. English teachers are not listed in the payroll who can receive salaries from the State budget. Meanwhile, schools cannot pay high to the teachers, because the schools’ budgets are limited. Those, who have high English qualifications, would rather to take other jobs than working as teachers. As a result, Vietnam has profuse good teachers, but lacks teachers for primary schools. Offering more preferences to English teachers? Deputy Prime Minister Nguyen Thien Nhan has instructed MOET to set up a legal framework which allows making English teachers at primary schools regular members of the personnel. If so, qualified teachers will feel secure with their jobs and devote themselves to the teaching. Nhan has also pointed out that it is necessary to “place orders” with universities on training English teachers for local schools as mainframes. It is also necessary to draw up the plan to send English teachers to training courses abroad in two or three years. Hien said that MOET has assigned some universities to compile curriculums on training English teachers for secondary and high schools. The Da Nang University is completing the programme on training English teachers for primary schools. Meanwhile, the Education Science Institute has been asked to set up the pedagogical standards for foreign language teachers. Nhan has emphasized that it is necessary to change one’s mind that foreign language is not a learning subject, but a tool in the future life. Therefore, teachers and students should think that they need to study to use in the future, not study to pass the exams.